It seems that every six months or so, we get a craving for Calamari in one of its many forms. Served as stuffed whole bodies, or deep fried to a crispy tenderness, or as a savory stew with or without Baby Octopus. It’s obvious which won out, and the dinner was easy. The well-seasoned Fettuccine with Butter and fresh Pepper supplied the starch. 1. Slice the Calamari into rings about 1/4 inch thick. Set them aside. 2. In a large deep saute pan, add the EVOO & the Garlic & Red Onion. Saute until translucent & tender. Add the canned Tomatoes, the Marinara Sauce, White Wine, Lemon Juice, EVOO, Salt, Pepper & Red Pepper Flakes. Simmer on medium low for about 30 minutes to give the flavors time to blend. 3. Add the Calamari to the sauce. Continue to slowly simmer for about another 45 minutes, stirring occasionally. Test for tenderness — the Calamari should be tender & the sauce very savory. 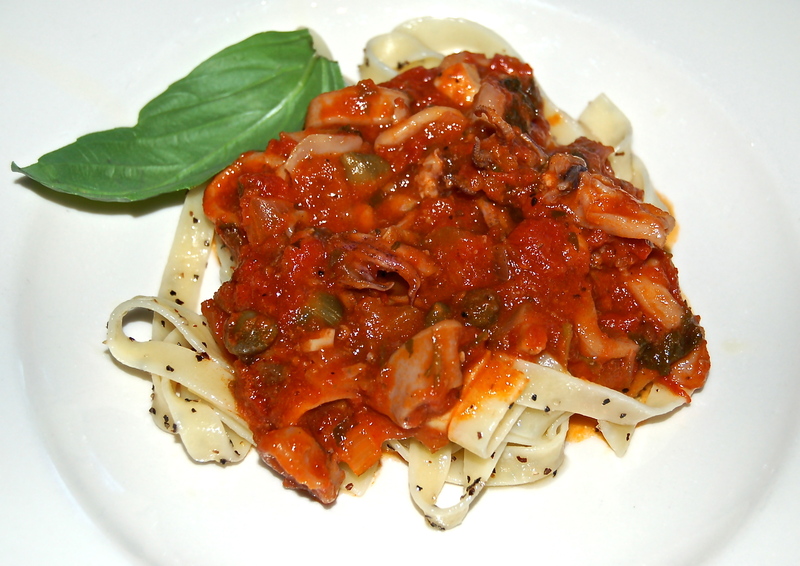 Add the Capers & the chopped Parsley, combine it all, & it’s ready to sit atop the bed of Fettuccine.